We receive many requests for olive oils with notable levels of hydroxytyrosol as indicated by the peppery flavors. 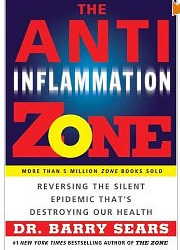 Many of these requests come to us from readers of Dr. Barry Sears’ book, The Anti-Inflammation Zone. (Olio2go is mentioned on page 92). Those readers and other Zone Diet followers have been looking for top olive oils for their diets. As such, they have been on a quest for olive oils with high levels of hydroxytyrosol. As there is no standard test for hydroxytyrosol, the best indicator is the polyphenol level. Much has been said and written about Tom Mueller’s book, Extra Virginity: The Sublime and Scandalous World of Olive Oil, since it was published in late 2011. (You can see it on our Recommendations page). We appreciated the minutiae and the revealing details in the quest for authentic extra virgin olive oil. We closely read the snippets and stories of olive oil production in Italy, Spain, Australia, and California. Mueller’s book includes facets of the industry that are very important to us. Sift through and you will find production costs (up to $800 per ton for picking and milling in California), tree to mill timing, and impossibly low prices in restaurant supply chains. We were thrilled to see the recognition for Villa Magra Gran Cru on the early pages, and we continue to be certain of our mission to import estate bottled olive oils for our customers. While the farm-to-table route may be a bit long, our goal is to deliver authenticity, excellence, and character straight to your kitchen just as it departed the frantoio in Italy. Some of our producers are so small that they don’t produce enough to put a case in every WF (~ 3oo stores ~ guess!) store across the country. More laughable would be the idea their oils could be stocked in a big box club store. Through the book, Mueller also reveals the delivery of a tainted bulk bladder of olive oil, described as like a small green whale, which picked up elements of contamination enroute. It took its journey via shipping container which had previously been treated with pesticides. The flexible bladder absorbed the pesticides, and while detected in time, the end result is a lawsuit. That’s why we continue to import oil in glass bottles. While the weight contributes to the cost, the integrity of the product is maintained. One of the biggest trends in olive oil sales in the U.S. are the bulk oil stores. Our extra virgin olive oil is sold like wine, based on the authenticity, estate, region, terroir, cultivars, and food pairings. The more layers or pathways between tree and table, the greater possibility of deception. Bottles, sealed, labeled, numbered, and leaving the estate just as they arrive to you, carries forth our mission to provide authentic Italian extra virgin olive oil. You can find the following at Olio2go right now (with a few coming soon! ): Tenuta Pennita (Alina), Colli Etruschi (more coming soon), Fontansalsa (Gemini), Fattoria di Monti (Monti and Razzo) Titone, Villa Zottopera (Rosso), DeCarlo of Puglia (noted in an early chapter of Extravirginity! 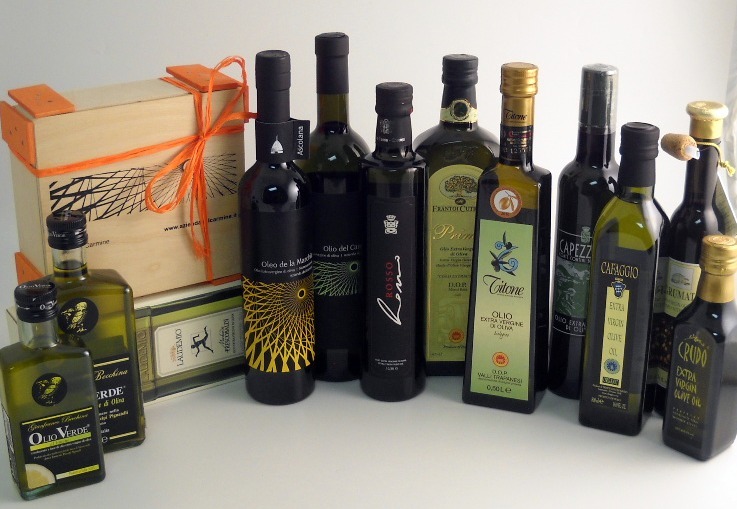 ), Cetrone, Quattrociocchi, Marina Colonna, Crudo, Frescobaldi Laudemio, and the collection of oils from Frantoio Franci. We recently traveled to California to take part in the Sensory Evaluation of Olive Oil Course presented by the UC Davis Olive Center and the California Olive Oil Council. Have no fear; we have not strayed from our mission to provide exclusively Italian extra virgin olive oil! We appreciate the knowledge of the Californians and we were able to translate issues to our business. Throughout the day we tasted extraordinary to ordinary, and even some “aged” oils. Tastings were primarily oils from California, and they only shared the names of the oils that were defect free. If there was any disappointment in the day, it’s that none of the dozens of samples were Italian olive oils. Yes, we tasted Ascolana and Leccino, but those were grown in California. It would have been great to compare a California-grown Ascolana to Azienda del Carmine’s award winning Ascolana from Marche. In one segment we tasted California-grown Spanish Picual in early harvest and late harvest pressings. The key descriptor is that the early harvest tasted like a quality artisan oil, while the late harvest was reminiscent of grocery store offerings. We spent time discussing nasal and retronasal aspects of olive oil. Sounds enchanting? With an element of surprise we were treated to the negative attributes found in fusty and rancid olive oils. Our session leader served a rancid Arbequina, and in the discussion that followed, we learned that she tried a 3-year-old Tuscan and found it too good to be useful for our aged sample. The bitter and pungent characteristics common to Tuscan oils are indicators of high polyphenol levels. Those same strong components hold off rancidity. In an official tasting, there are a number of restrictions to ensure an unbiased evaluation. 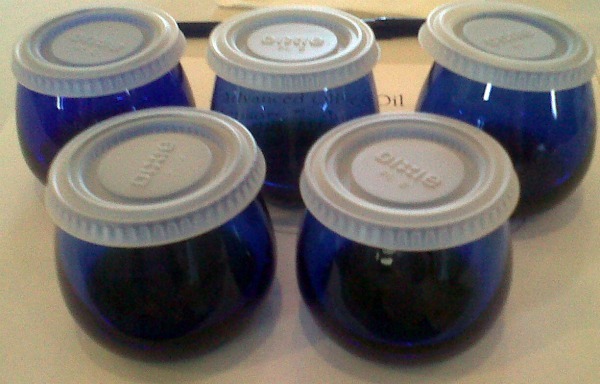 The tastings are conducted with blue glassware to eliminate the influence of color. There are scoring sheets designed to make fair evaluations, and the high and low score sheets are discarded. Panelists are isolated, and a minimum of 8 tasters must be present. 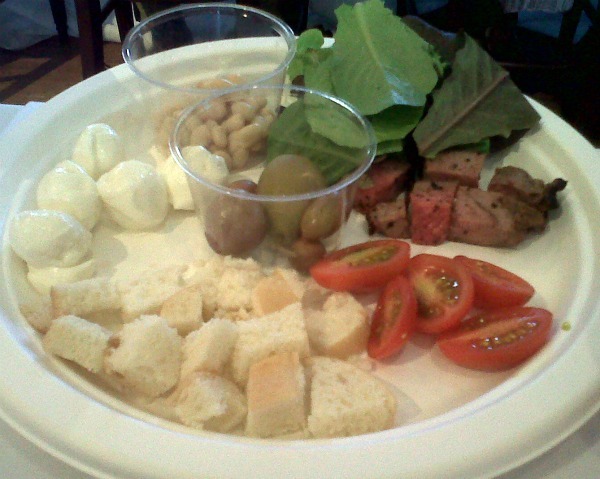 In our sessions, ten oils were tasted straight from cups, and then five of those oils were tasted with each of six foods (mozzarella, beans, cherry tomatoes, bread, field greens, and steak). As we discussed industry trends, the focused moved to the future of olive oil tasting and evaluation. One bright spot is the development of Association 3E evaluating Super Premium Olive Oil in Florence. La Poderina Toscana is one of the top oils on that list. You can see La Poderina Toscana’s evaluation here. 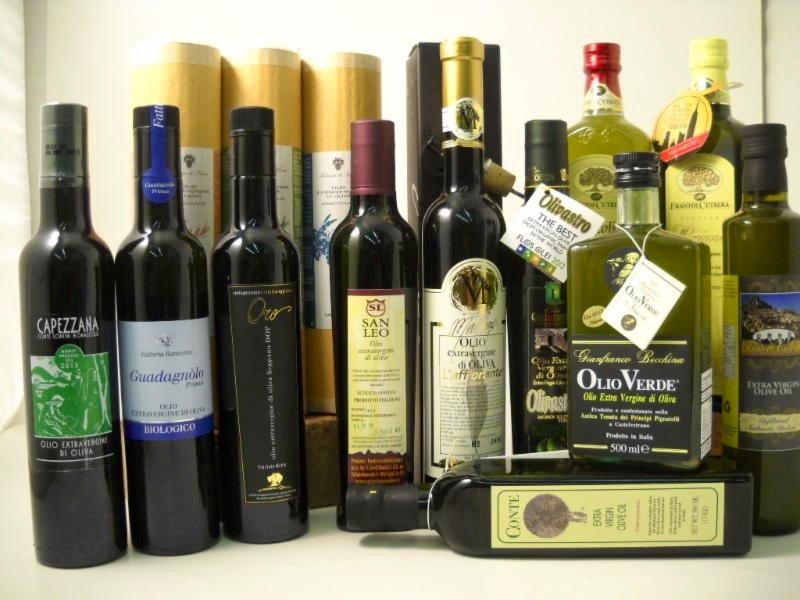 Quality olive oil has made great strides in a relatively short period of time. The olive oils of the ancient Greeks and Romans would be far more like the oils we now identify as rancid. The characteristics of a premium olive oil (excellent quality olives, good pressing conditions, minimal introduction of oxygen, and controlled bottling, storage, and transportation) were all unknown or unachievable until relatively recent times. While the ancients made a quality product, critical to their civilizations, they might not recognize today’s best oils. 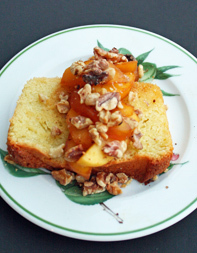 Tasting Table has just published this recipe for Olive Oil Pound Cake with Glazed Apples, and the combination is frankly, magical. Thinking about Olio2go’s selection the first two extra virgin olive oils that come to mind for this just dessert are Olio del Carmine and Principe di Mascio DOP. Both have just the right combination of fruity and not-too-intense to make the most of this delightful dessert. Early word from the 2010 Los Angeles International Olive Oil Awards is that Olio de la Marchia Ascolana has been awarded Best in Class.